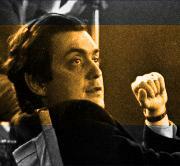 This page links to four separate sites exploring the work of Stanley Kubrick. The Kubrick Site is a non-profit archive for documentary materials; The Kubrick FAQ, attempts to answer some of the questions asked on alt.movies.kubrick; 2001: A Space Odyssey Program, showcases the original 1968 foyer program that accompanied the first release of the film and Stanley Kubrick 1928-1999 is the archive of a site that closed September 1999. These sites are maintained by Roderick Munday.